Hernán Cortés was a Spanish explorer and soldier who conquered the Aztec empire. This resulted in large areas of Mexico’s mainland being ruled by the Crown of Castile, during the early part of the sixteenth century. Interestingly, the Gulf of California was originally called the Sea of Cortes. Hernán Cortés was born in Medellín, a village in northern Spain in 1485. His father was Martín Cortés and his mother was Catalina Pizarro Altamirano. Cortés was often sick while a child. When he was fourteen he was enrolled in Spain’s University of Salamanca to study law. This was the main center of learning in Spain during this time. He only stayed two years and then returned home to the displeasure of his parents. In 1504, Cortés set sail for Santo Domingo, now the Dominican Republic. In 1506, Cortés assisted Diego Velázquez in conquering Cuba and Hispaniola. For his efforts, he received many acres of land, as well as slaves. In 1518, he convinced the new governor of Hispaniola, Velázquez, to make him the commander of the new expedition to Mexico. This area had just been found by European explorers and was said to have great wealth. 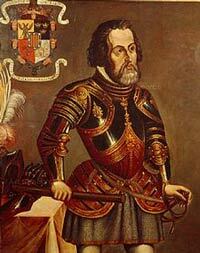 In February of 1519, his expedition reached Mexico. He soon became allies with a few of the natives he met, but with many others he had to use lethal force to conquer them. He fought against the Cholula and Tlaxacan warriors after which he decided to take over the entire Aztec empire. He went to Tenochtitlán which was not only the Aztec capital, but also the home to Montezuma II. Next, he captured Montezuma and had his soldiers raid the city. He left the city when he learned that Spanish troops were going to arrest him because he had disobeyed orders. After a face-off with Spanish forces, he went back to Tenochtitlán to discover a revolt in progress. Eventually, the Aztecs drove out the Spanish invaders from their city, but Hernán Cortés came back and took the city in 1521. One year later, Charles I, the King of Spain, awarded Cortés the governorship of New Spain. Cortés continued to explore many parts of Central America, in hopes of finding a strait that connected the Atlantic Ocean with the Pacific Ocean. Following his triumph over the Aztecs, he faced many challenges to his position and authority. In 1524, Cortés went to Honduras to halt a revolt against him. When he returned to Mexico, he learned that he had been stripped of his power. He went to Spain so he could plead his case with the King of Spain, but Cortés was not reappointed governor. In 1536, he explored the north western area of Mexico and there he discovered the peninsula that he named, Baja California. This was his last major expedition. In 1540, he went back to Spain and retired. Cortés spent most of his retirement years looking for recognition for his many achievements from Spain’s royal court. In December of 1547, Hernán Cortés died at his estate in Seville.